After the successful completion of my Aeroponic Contoller V3. 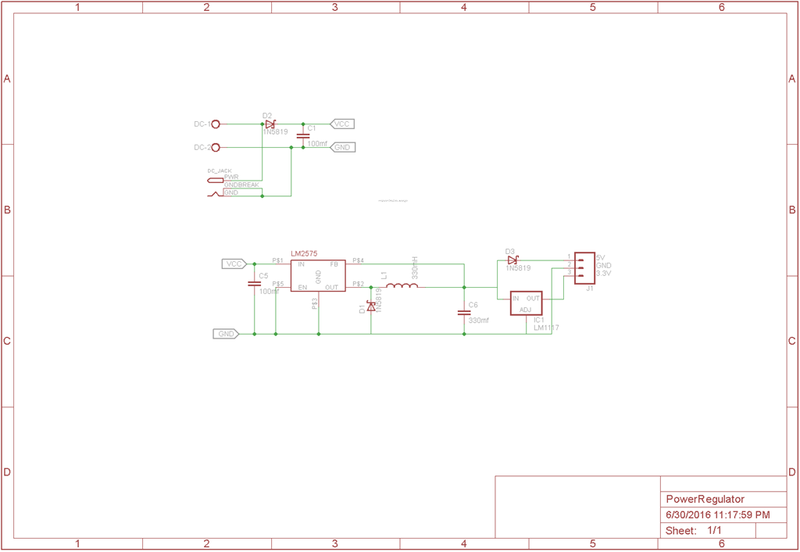 I started designing the next version of the PCB. This time I decided to package every thing in a single board. In V3, controller depends on external relay modules to on/off devices. In the new version Relays are inbuilt. One of the major change in the new version is, the system is controlled by a bare bone Arduino using Atmega328. The new board has all the features of V3 plus some new features. The board has several debugging features which allow me to monitor the internal activity of the system via a serial monitor. 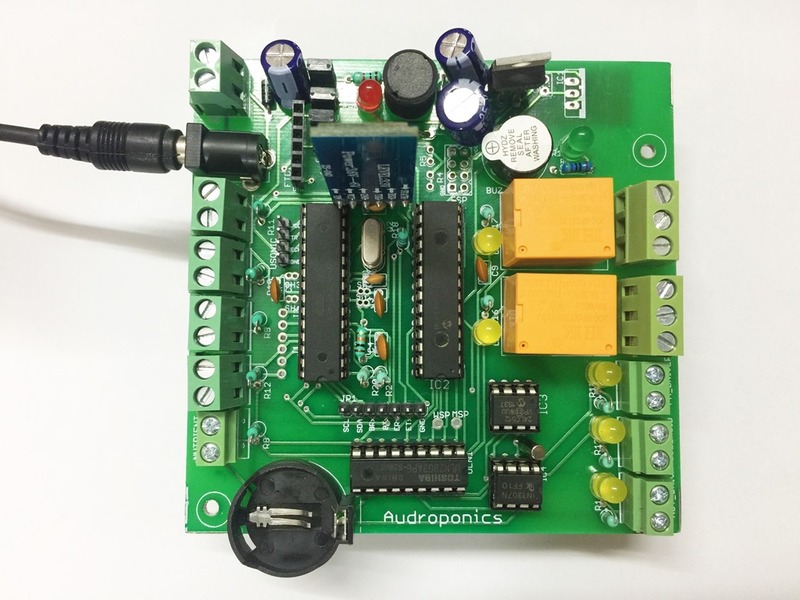 The board also has the ability to communicate to an external Arduino via I2C, this feature is very essential in case of testing and bug fixing. The below system is currently operational at my home. As you can see the system uses 4 external relay modules. Controlling Water Pump: One of the crucial part of Hydroponic/Aeroponic system is the cycling of water in periodic intervals. A water pump is used to cycle the water. The controller should be able to switch on motor in a particular interval and keep it on for a configured time. Say run motor every 30 mins and keep it on for 3 mins. This settings can be configured from the mobile application. Nutrient Feeder: In Aeroponic/Hydroponic the fertilizers (called as nutrients) are mixed into the water. In normal scenario we need to add it manually, the system uses two dosage pumps to add nutrients. We can add nutrients two way, either via the mobile app or by manually pressing a button. Through mobile app, we can specify how may ml of nutrients need to mixed to water. Nutrient Mixer: Used a small wave maker to mix the nutrients while adding it. Maintain Reservoir Water Level: One of the important thing to consider is, the water pump should not dry run, if it does then ready to buy a new one. In this version, used water level sensors to know the water level. The system used a solenoid valve, which is connected to a water source. When the water level goes down to a set level, system will activate the valve and start filling the reservoir. Once the water reaches a set level, system will switch off the valve. pH Feeder: This is a new feature, it’s very similar to Nutrient feeder. Instead of adding nutrients this feeder adds pH modifier like Phosphoric acid or similar modifiers to correct the pH level of the water. 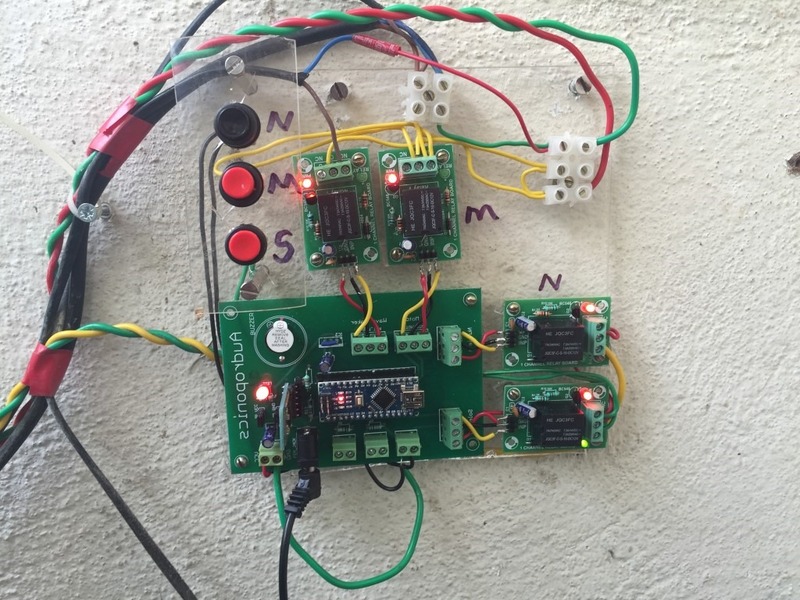 Real Time Clock: To deal with time critical logics. WiFi Module: Allow the system to communicate with Internet, this allow me to control the system from any where in the world. Communication with the Controller: I am reusing the Android application I wrote for V3. As of now the system talks via Bluetooth. Last week I got interested in Cyanotype photographic printing and started investigating about the chemistry and the whole process of doing it. It’s real fun and cheap way of printing photographs. 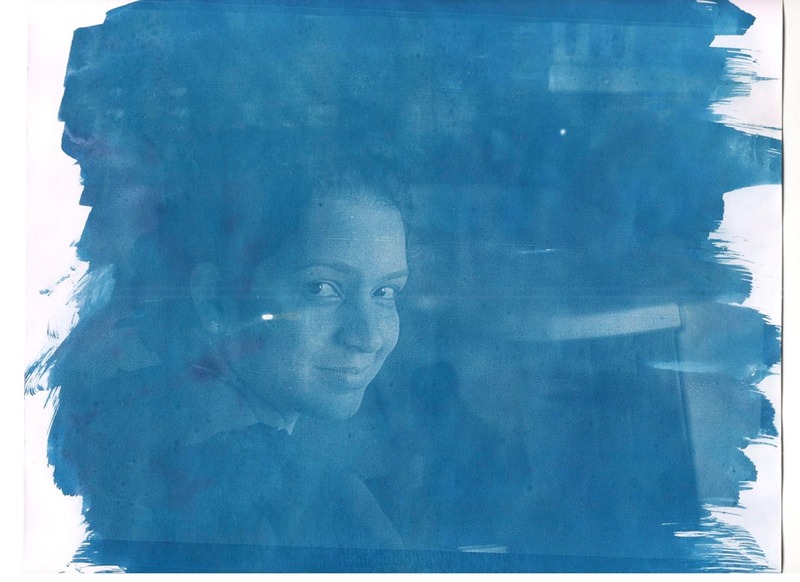 In short Cyanotype printing involves sensitizing Paper/wood/cloth/glass with some chemicals and expose it to UV radiation/Sun light with a negative film covering the print area. There are hundreds of tutorial talking about the whole process, here I merely repeating the process again. 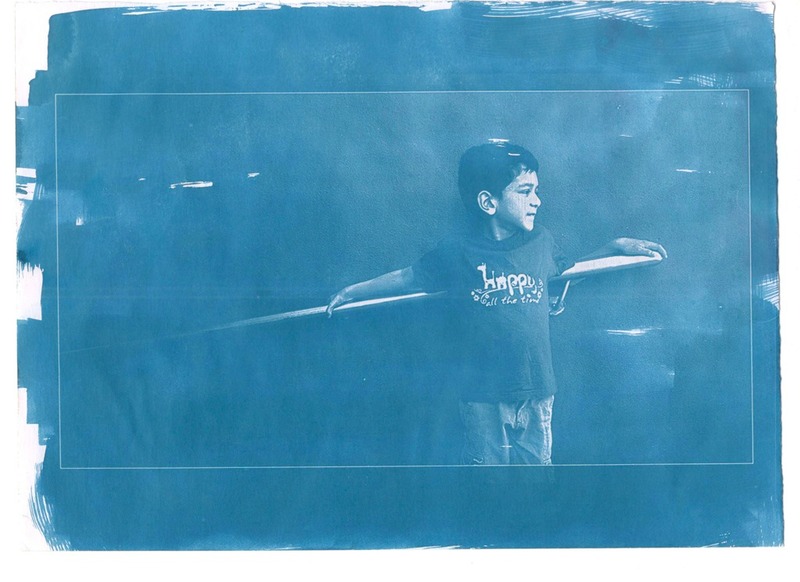 In Cyanotype process two major components are the sensitizing chemical and the paper. Let’s talk about the steps in Cyanotype. Most of the tutorials of Cyanotype process talks about Ammonium Ferric Citrate (Green), I couldn’t find Green version instead I used the brown one. These two chemicals comes as powder, so need to mix it to create A and B solution. Solution A: 100 ml water and 25g Ammonium Ferric Citrate mixed together. Solution B: 100 ml water and 10g Potassium Ferricyanide mixed together. Note: some sources says, use distilled water, I used the normal filter water for mixing. Both A and B should be kept in separate containers. This can be reused to create working solution. To create the working solution, take equal parts from two (A and B) solutions and then mix well. Paper type is very important in Cyanotype process, I used different types of paper for this process. I got really good result from very cheap drawing paper sells at normal stationary shops, which cost around 8₹ for a large sheet and can cut 6 or more A4 sheets. I also tried with A4 paper which cost around 12₹ each and got a very dirty yellow look, which I didn’t like. I suggest start with cheap drawing paper. Next we need to sensitize the paper with the working solution we created from the A and B solution. I used a normal paint brush and paint the solution to the paper. Make sure to use a moderate dark room. Keep the paper to dry in a dark place, I used my bookshelf to dry it completely. You can also use a hair dryer and can be used immediately, I don’t have a hair dryer instead I used a hot air gun in very mild temperature. The paper will turn yellow once it dried. I experimented with A4 size paper. To print photos, we need to create a negative of A4 size. To create the big negative I used a black and white photo and invert it in an image editing app. Then adjust the contrast to get a desired look for the negative. This negative should print on a transparent sheet, I bought couple of OHP sheet and print the negative using my laser printer. Next we need to expose the sensitized paper with UV rays. I used an A4 size plywood and transparent plexi glass to keep the paper and negative in position. Here is good video showing the whole process. Sun light is the best resource for UV rays. But I live in an apartment and I don’t get enough sunlight in my balcony. So I used a light source created for my Aeroponic system. My Light source is an array of 3W red and blue LEDs, which I sourced from Aliexpress and assembled by me and my father. Also this artificial UV source helped me to experiment at night as well. 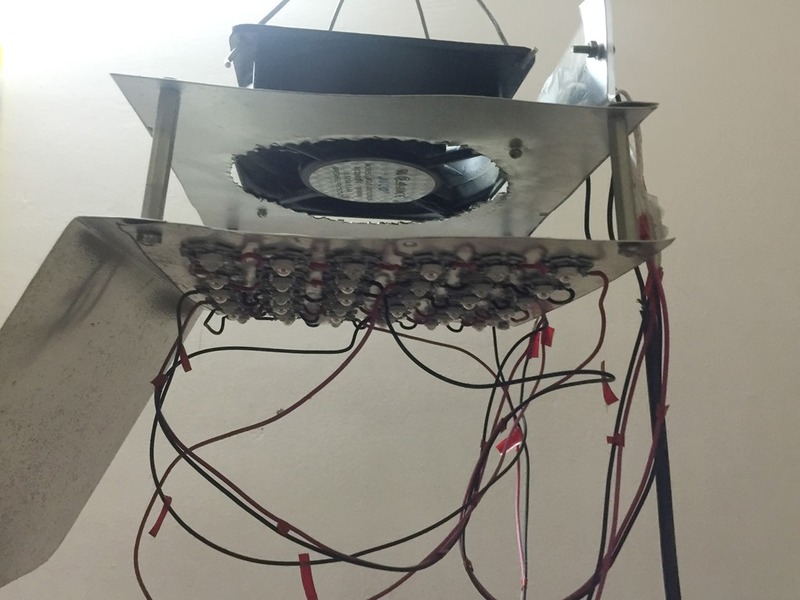 Below is my UV light source, it’s not very fancy, a DIY system. Important part is, it’s shock proof :). In normal sun light, we need to expose the paper for about 8-10mins, in my light source I need to expose for around 50mins. I experimented with different exposure time and came to 50mins as ideal. Developing the paper is an easy process, just dip the exposed paper in water for 3 to 4 mins. My tap water is bit Alkaline, Cyanotype works well in Acidic water, so I put couple of drops of Phosphoric acid to water to make it acidic and wash for a minute then wash it in normal tap water for about 3 mins. The timing can only determined by trial and error, when you see the blue color is fading take the paper out and keep it for drying. 1. Dirty yellow stained print, this caused by the paper type. This A4 sheet is around 12₹, but gives me a very bad output. 3. Reasonable good print, exposed for around 50mins. All the above photos are scanned using a normal scanner not from a good photo scanner. Later I will post some photos from my photo scanner. The actual image looks a bit more bluish. I need to spend some time experimenting the bleaching and tanning process. The whole process is real fun, need to experiment with different photos as well. A month ago, my CEO Simon Weeks visited India and he gave me a very surprising and one of my most valued gift, a Nikon FM3A along with couple of Black and White films. It’s one of the greatest Camera ever made, Ken Rockwell has a great post about this camera. With this Camera, my journey starts in Film photography. At first I didn’t knew how to load a film, Simon gave me a short introduction about loading the film and theoretically he take me through the processes of washing the film. As a DSLR user, I am habituated to check the LCD to see the preview of what I captured and adjust the exposure settings, if I am not satisfied. In film world I have no preview, so I should be very clear about the metering techniques and exposure. I have a good knowledge about Exposure but I refreshed my knowledge once again to make sure I will not do any mistake while capturing in film camera. Photographing in FM3A is quiet a new experience. This camera will not autofocus, but the split screen focusing system is a great feature, which allows me to focus easier. Still I get some out of focus photos and learning my focusing skills. I really enjoy photographing with FM3A, it’s a very simple system, not many settings to fiddle with. Adjust the exposure and Aperture (if needed) and click shutter release, as simple as that. Note: Shouldn’t try film SLR, if you are shooting in DSLR with Auto mode dialed in. It’s like sitting in a driverless car, in this case camera adjust Aperture and Exposure by itself, photographer only need to do is simply click the shutter release button. Instead in SLR world, you need to adjust the exposure yourself. 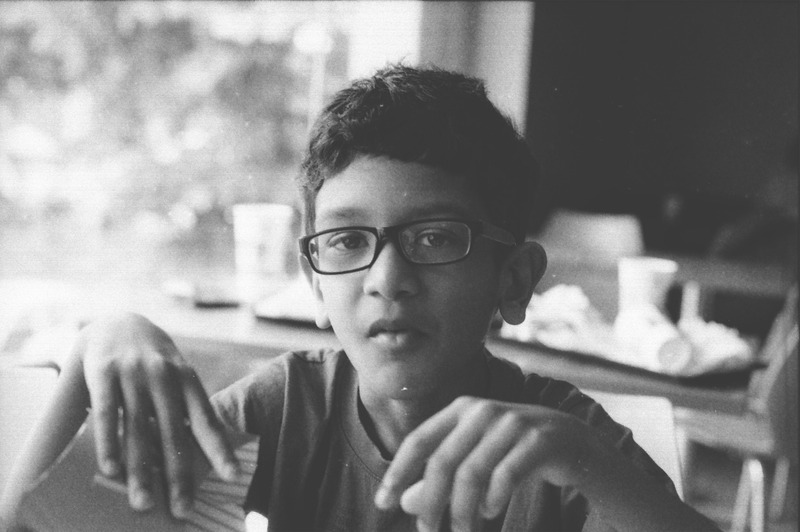 In my searches I come across film photographer named Prasanna Subbarayan, in one of the post he talk about developing film using XRay developer. I contacted him via email and later I talked to him via phone. He gave me the chemistry of developing using XRay developer. 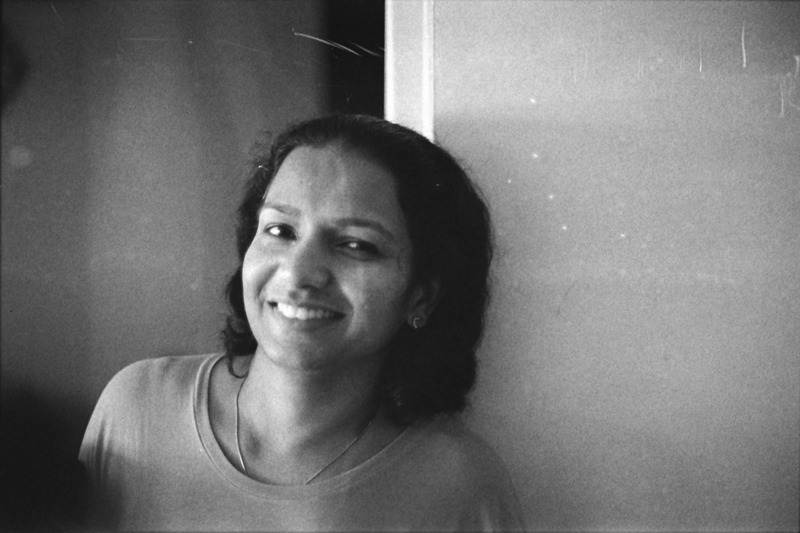 I got some developer from my Dentist and developed the first film roll. The result was good. First of all I cant judge my developing skills yet, learning from mistakes. For developing my second film roll I bought Sterling Universal Film developer from GG Wellings, Sterling developer cost 60 Rs, to create 1 litre stock solution. 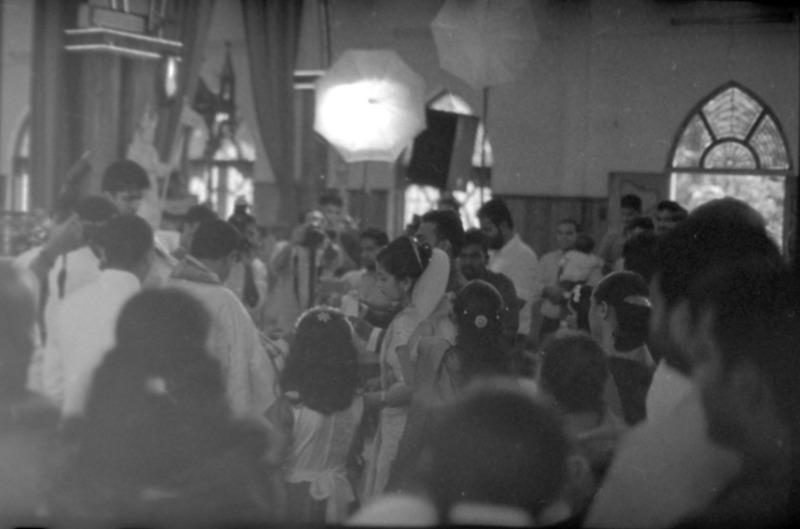 I used XRay fixer to fix 35mm film. Ofcourse I need a dark room to load the film, as of now I used one of my room at night with all light switched off, to make complete light proof, I cover myself and film using a blanket. It’s too hot : ). My father is making a setup to load film, I will update the photo of it later. 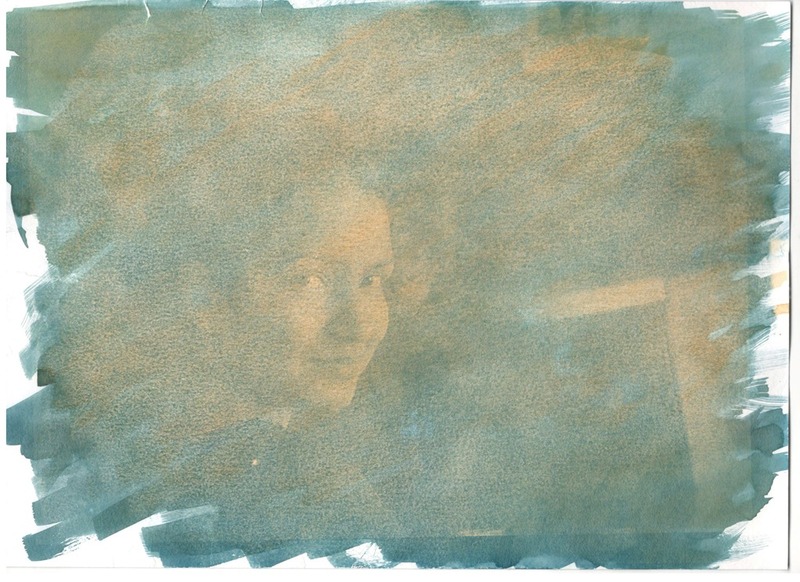 I used my DSLR to photograph the negative, then invert it via any processing application. But I didn’t get a good quality from it, to get good quality I need a macro lens. Then I tried with my iPhone camera and started getting satisfactory images. To capture the film, I created a small light box using an empty cardboard box. I felt like, I am getting a better result than anticipated, I decided to buy a dedicated Film Scanner. I got a good deal in Amazon.in for Canon 5600f and bought the scanner too. I did some scanning and I am getting pretty decent photographs. When I edit my DSLR photos, mostly I convert my photos to Black and white, I tried to achieve a film feel with a bit of grains. Now with film, I got what I really wanted. Also the process of developing, and after 15 to 20mins of development process, the moment you see the washed negative, it’s all real fun. I really didn’t get that anticipation in Digital world, I know what I got from the Preview screen of my Digital camera. I am using a Logitech M570 for last two years. It’s a pretty good mouse and a bit expensive. Unfortunately Logitech uses some pretty cheap crappy switches for left and right buttons. After a year the mouse wont register button clicks properly, it’s a nightmare to use it. I did every thing I can but no changes. I live with that situation for some time and then decided to change the mouse, but couldn’t found any mouse that’s very similar to M570. Recently I did some searches and found one video that shows, how to rectify this issue by changing the switches. The video was very explanatory and guide me to open the mouse and successfully taken out the board. I have to remove those switches outlined in Red, those are very cheap switches. Logitech taken us for a ride with these switches on an expensive mouse. I have all the necessary tools to desolder these switches from the board and in some time I taken out those switches. I need to give a little pressure to remove this switch after desoldering. 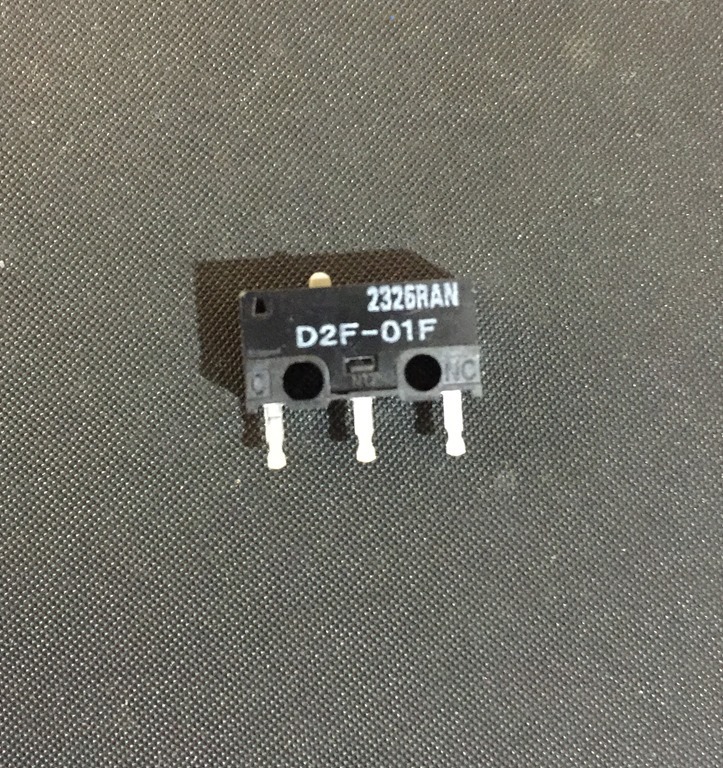 To replace the switch, I bought couple of Omron D2F-01F switches, these are very high quality switches made in Japan. 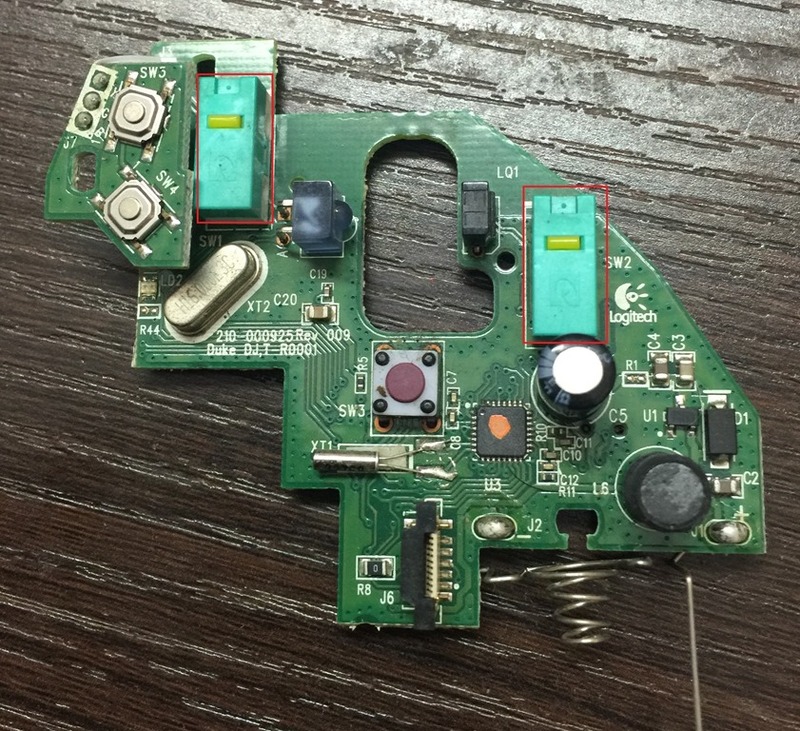 After fixing the new switch, my mouse is good as new. Both left and right clicks works perfectly. Is it worth the fix? For me yes, buying a new mouse is a costly affair and I have all the necessary tools to replace these crappy stuffs. Even if I buy a new one, most probably Logitech will be using the same switches and I will be in trouble sooner or later. Note: Try to get the Omron Switches from any dealer, do not buy from Amazon or any online sites. The cost of these switches are less than 80.00 INR, in Amazon these switches cost around 319.00 INR. Couple of weeks ago I designed and etched a home made pcb to program my Atmega 40 pin family micro processors. After that I redesign the PCB layout, so that I could program all the necessary processors like Atmega 40 pin, Atmega 28 pin and Attiny 8 pin family processors in a single board. 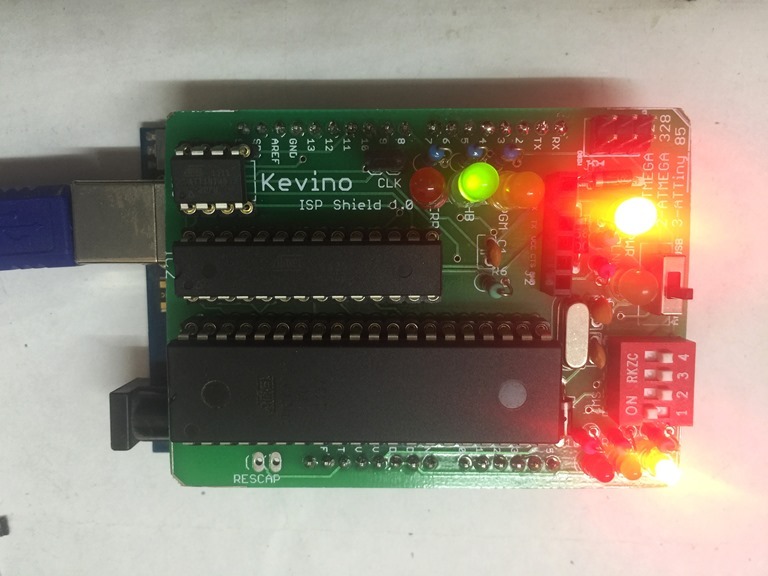 I named this board as Kevino after my son Kevin. 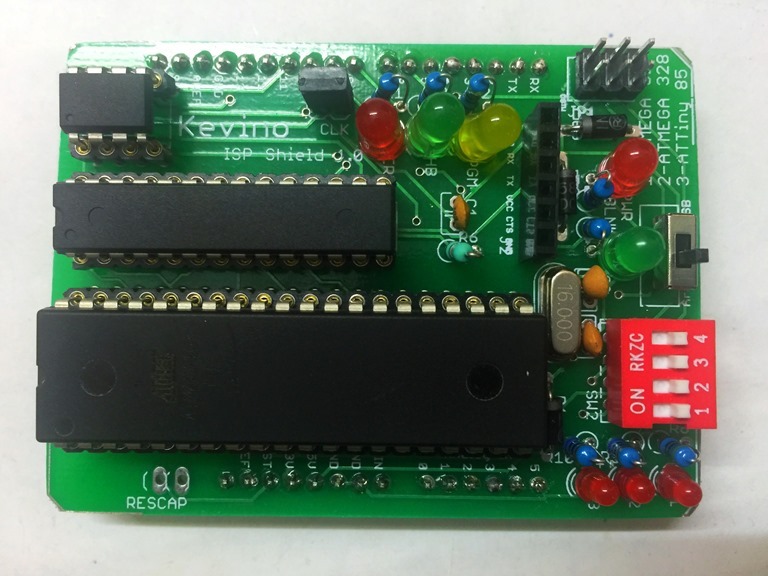 I also wanted this board in Red because my son is crazy about Red but fab house said it’s difficult for low volumes, so went with standard Green solder mask. I received the board yesterday and assembled all the components. Below is the final outcome. 1. Program any one chip by selecting the respective chip via the red dip switch. 2. The chips can be Bootloaded and programmed via Arduino uno Or using a USBASP programmer. 3. Should be able to program and monitor serial communication using USB to TTL Adapter. I can plug the TTL adapter to the female pins in the board. 4. I can also test Blink program, an on board LED to test Blink and make sure the chip bootloaded successfully. With this shield I can Bootload and program all the Atmega Processors I used for experimenting. One important tool when you deal with Microprocessors are, regulated power supply. To power my standalone Atmega’s and test the working I assembled a regulator in a breadboard along with Atmega. I cant relay on some thing running in a breadboard, a loose wire can create tiring troubleshooting. So I decided to build a permanent solution by creating a PCB and assembling the components. 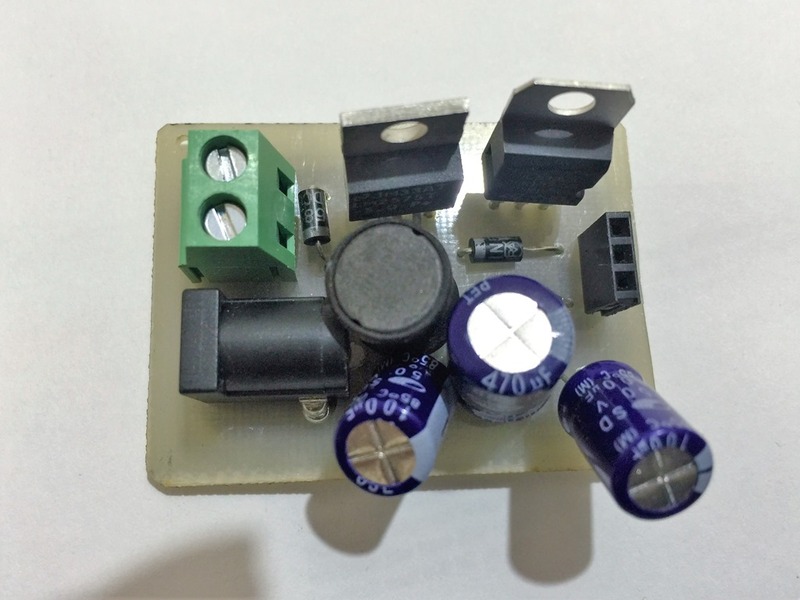 My requirement is simple, connect a 12v adapter and I need 5v and 3.3v output. The 3.3v should provide a minimum 300mA. I have to use this power supply to power ESP8266 or any module that uses 3.3v. I am using LM2575 to provide 5v and LM1117 for 3.3v. Theoretically LM2575 can withstand upto 40v. 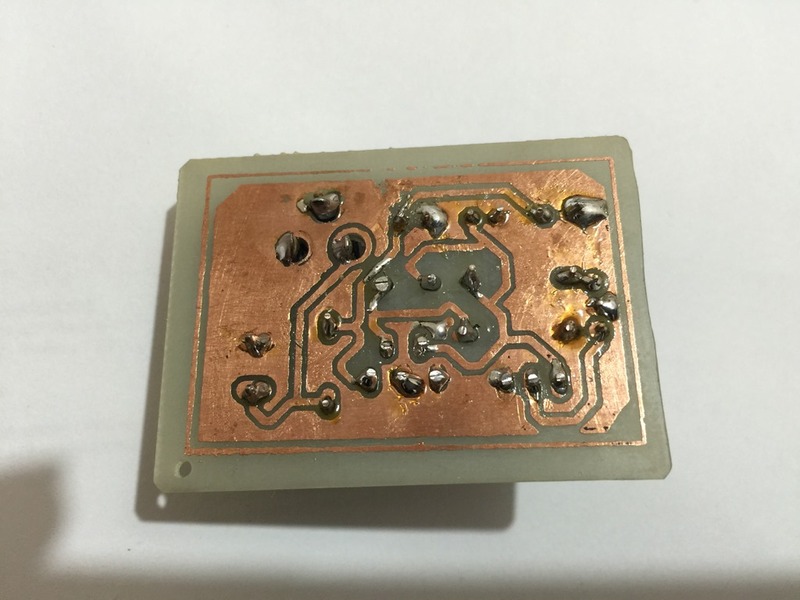 Here is the PCB I created and assembled at home. Lacking some soldering skills, still learning how to solder well. I can give input voltage via the DC Jack or screw terminal. Three female pins at the right hand side provide 5v, GND and 3.3v. Forgot to include a LED to show the voltage status. When we work with processor like Amega328 or ATTiny85 we will come to a situation like we are running short of GPIO pins. One option is to go for 40pin processors like Atmega16/32/324, etc. But there are some cons with 16/32, these chips doesn’t have PCINT (Pin change interrupt) and we cant use software serial. If we are not dealing with Software serial then we can use these MC’s without any issues. Some of the experiments I am doing, deals with Software serial, so I decided to use Atmega328. But I need more Digital I/O pins. 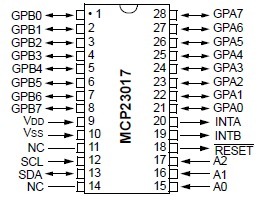 To get more IO we can pair Atmega328 with GPIO expanders like MCP23017 or MCP23S17. Keep in mind that MCP23017 talks via I2C and MCP23S17 talks via SPI. I prefer I2C as it uses two pins of my Arduino, SCL and SDA. SPI needs 4 pins, MISO, MOSI, SCK and RESET. 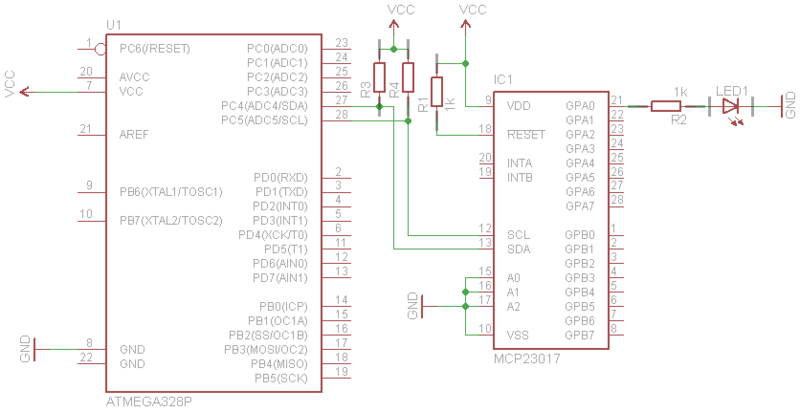 Also in my system there are several other chips connected to I2C bus and thus deals with only one type of communication. As you can see we have 16 GPIO’s in MCP23017, 1-8 and 21 to 28. Arduino SDA to pin 13. MCS23017 RESET pin to pin9 with a 1k Resistor. Now we need to set the I2C address of this pin. You can connect upto 8 MCP23017 by changing connection to A0 to A2 (pin 15 to 17). For e.g. connect all three pins to GND will get an address of 0, connect A0 to VCC and A1 and A2 to GND will give an address of 1 and so on. Here I am connecting all the pins to GND and I get an address of 0. Here I am not detailed the connection to Atmega328. I focused on the connectivity between 328 and MCP23017. 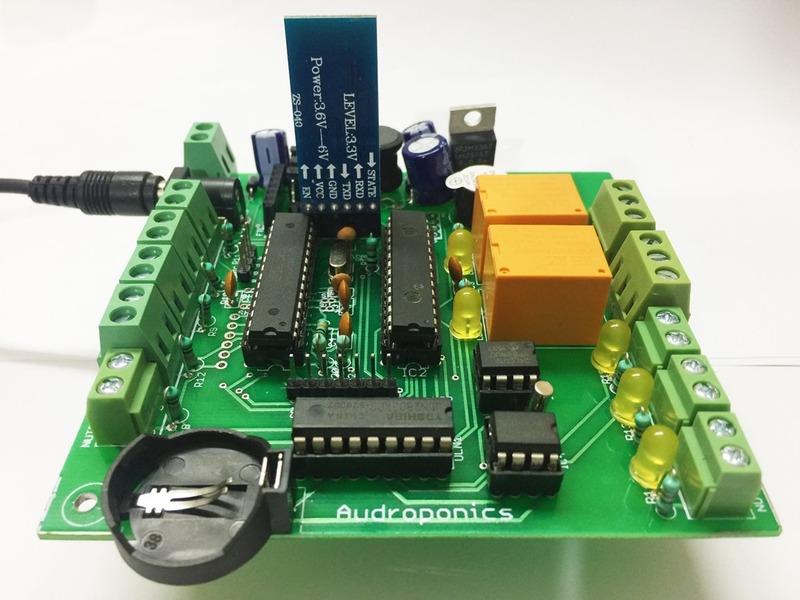 To see how to run an Atmega in standalone mode, check this post. Edit: As Anon suggested in comments sections, I added a pullup resistor to SDA and SCL lines. I2C is open drain and without a pullup resistor the system will not work. I used Adafruit library to interact with MCP23017, you also can directly interact with expander by just using wire library. There is a good post explaining how to write data to MCP23017 without any library. Here port 0 is referring to pin 21. Here I talks about I2C connectivity but you can also use SPI using MCP23S17. These expanders are not limited to Atmegas we can use it with Raspberry pi’s or any other processors that supports I2C or SPI communication.